A key feature of this campaign is the unpopularity of the Wynne Liberals; they have become the unacceptable alternative, making the effective choice between the Doug Ford PCs and Andrea Horwath's NDP. Why? A principal reason is that the Ontario Liberals have been in office a long time. It happens to all governments and the Liberals have been in office in Ontario for almost fifteen years. Grievances accumulate, sharpen and deepen even to the point of being exaggerated as I think now is the case. Most of the issue grievances had their origins in the McGuinty government (with the exception of the privatization of Hydro One, a key Wynne initiative) but she takes the blame. However, economic factors (as discussed below) have also contributed to Liberal woes. A similar phenomenon happened in Alberta in 2015; a variation of it looks like it will happen to the Quebec Liberals this year. In the case of Ontario, underlying this malaise are economic conditions that, despite the strong performance of the last two years, have created discontent. This chart, adapted from Statistics Canada data, tells a part of the story. 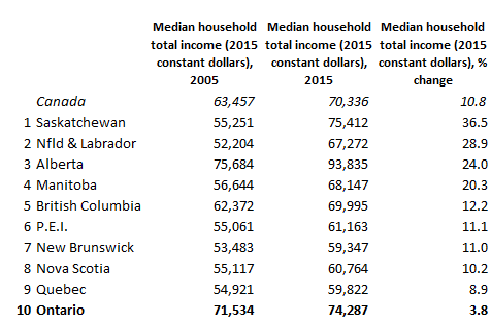 It measures growth in median incomes from 2005 to 2015 among the provinces and Ontario finishes dead last. This chart was also discussed recently in the Globe and Mail in the context of the election. Not surprisingly the Liberals are taking it on the chin, particularly in non-metropolitan parts of the province. This is not the only time that the economy, which is only partially influenced by Ontario government policy, but whose overall strength is strongly tied to the North American and international economies, has played a decisive role in provincial politics. The Bob Rae NDP government did make some unwise decisions, but their political fate was sealed from day one because the economy had already started down the road to the deep recession that was to plague them throughout their term before they were even elected. By contrast the Mike Harris PC government was elected just as a strong recovery in North America was beginning to take hold led by the United States. Nobel prize-winning economist and advisor to Bill Clinton, Joseph Stiglitz wrote a compelling book about that decade's economic growth - its title, The Roaring Nineties. On top of the strong U.S. growth the Canadian dollar declined throughout the nineties adding to Ontario's competitive advantage. That did not stop the Harris Tories from thinking it was them. In effect they were born on third base, but thought they hit a triple. If bad luck intersects with bad policy, a recession becomes a real risk. We would keep a particularly close eye on two traditional business-cycle killers-the Fed response to stronger-than-expected inflation in the US and a growing shortage of oil, pushing prices to new heights. Perhaps the 2018 Ontario election is not one you want to win.